The 1976 Winter Olympic Games were originally awarded to the city of Denver, but they withdrew after some financial concerns. But during the bid, Massimo Vignelli designed a few things, including this wonderful candidate poster. This is one of my personal favorite posters from that era, the way the 76 is cropped off acts as a teaser. 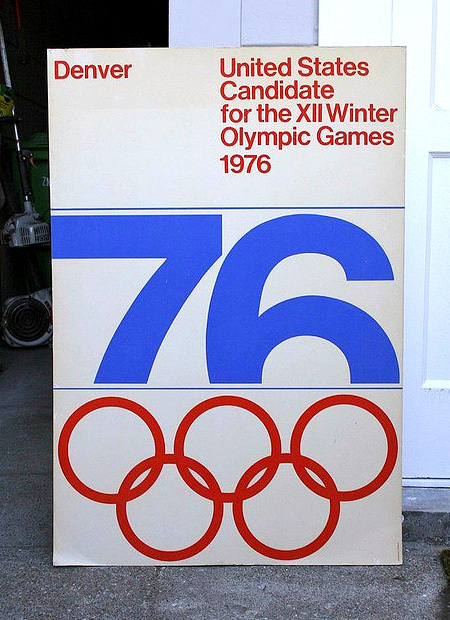 2 Comments on "1976 Denver Winter Olympics Poster"
I love the old vintage olympics posters. I agree that the 76 is one of the best features on this one. I also really enjoy that the blue is not the traditional red, white, and blue, color we see everywhere else related to the olympics – it definitely ads to the vintage feel. I wonder what it would look like if the olympic rings were cropped similarly to the 76, but on the top. Anyway you do it the design is always going to be classic. I would love to have this hanging on my wall!